Student Housing Business is the voice of the student housing industry. MAIL & PACKAGE DELIVERY January/February 2017 StudentHousingBusiness.com 62 A Package Deal Flooded by an onslaught of packages that are turning leasing offices into mini-post offices, managers search for solutions. By Lynn Peisner P Package management may not contribute to a property's reputation as much as reliable internet or a great location near campus, but it's becoming a more serious management concern, and quickly. Students, too, are start- ing to take notice of how packages are han- dled at their communities. The Census Bureau of the Department of Commerce reports that U.S. retail e-commerce sales for the third quarter of 2016 were $101.3 billion, which accounted for 8.4 percent of all retail sales in total and was an increase of 4 percent from the second quarter of 2016. The volume of online ordering rises each quarter. In 2006, online sales accounted for only about 2.5 percent of all retail sales. There was a time when package delivery to conven- tional apartments was a bigger challenge than it was in student housing, but those days are a distant memory. "The biggest reason for package volume in student housing can be summed up in two words: Amazon Prime," says Chris Moreno, vice president of national partnerships for Luxer One. Luxer One's sister company, Laundry Lock- er, debuted self-service lockers in 2005 as a means to securely pick up dry cleaning 24-7. The company has since expanded as Luxer One to provide package delivery lockers to conventional and student apartments as well as to other businesses. Amazon Prime is free for students for six months and then is offered at a discounted rate. "They're training these students to be hooked on Amazon," Moreno says. "I was recently at a student housing community at the University of California, San Francisco. There is a CVS/pharmacy about 300 feet away from the property. Yet the managers say that residents would rather order on Amazon to get toothbrushes and razors and all the nor- mal stuff they need rather than set foot in that CVS. They already feel like they're paying for the shipping as part of their Prime member- ship. And it feels like it's saving them time, too. That's the kicker for students." Demand Rising Craig Meddin, CEO of The Postal Solutions Companies, estimates that student apartments receive a 10 to 15 percent higher volume of packages than conventional multifamily. 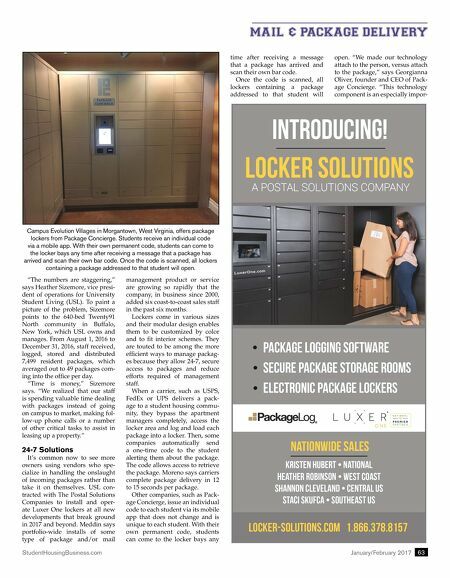 The Postal Solutions Companies offers a spectrum of mail and package management services, including offering Luxer One lockers, package rooms, and PackageLog, a proprietary pack- age logging software. PackageLog allows managers to log and deliver in-bound packages with automated text messages and email alerts in just a few seconds. Revenue from the PackageLog soft- ware, which integrates with the three major property management software systems, has grown 100 percent year over year since it launched in 2013, and PackageLog recently logged its four millionth package. Package rooms are another option that func- tion similarly to lockers, but place all pack- ages in one large, secured room that is under continuous camera surveillance and enables students to retrieve their own packages after receiving a one-time access code. Package rooms can also be used as supplements to locker systems to house perishable or over- flow or items such as furniture or skis that are too large to fit into a locker. Meddin has seen firsthand how package management has gone from a concern that barely registered on an operator's radar to something that's now a leasing amenity. As recently as 2011, Postal Solutions' prac- tice was to place paper notices saying a stu- dent had a package waiting in their mailbox. "We would print up to a half million of these slips a year," Meddin says, "and we would budget for an increase year over year, then in 2011, seven months into the year, we ran out entirely. That was really the kicker that told us that package volume due to online shopping is really increasing in student housing." What does this problem look like in every- day life for a student housing manager who is handling packages on their own? It can be an enormous burden and even ultimately harm a property's reputation as well as lessen the time and resources that should be devoted to leasing and overall management. Luxer One offers package rooms as an option to let students collect their own packages on their own schedule. Carriers deliver packages to the large, secured room that is under continuous camera surveillance, and students retrieve their own packages after receiving a one-time access code.